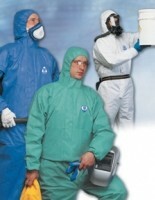 Innovative design sets the new disposable coveralls apart from existing products in industry today. North-Gen coveralls are the only ones with ventilated gussets. This design innovation is important because non-porous coveralls can be very uncomfortable in warm conditions. There are three models available: North-Gen Air, made from a white, revolutionary, soft polyethylene, bonded to a non-woven polypropylene that offers superior resistance to dust and minor chemical splashes. North-Gen Pro is made from a blue, non-woven breathable, multi-layer polypropylene, also for dust and chemicals. North-Gen FR is made from a green, non-woven, breathable multi-layer polypropylene with a flame retardant treatment for arc flash risks and fire fighting.